Cosplay & Coffee takes pride in finding the best cosplay products for our viewers. We’re looking for brands who are great sources for cosplayers. All reviews with be an unbiased, truthful opinion of the writer. Reviews may come in the form of a blog post, YouTube feature, or Live video. Email tiffani_daniel@yahoo.com for further discussion. If you sell suits, wigs, shoes, full costumes, or makeup that is used by the cosplay community, we want to review your product! Anything that falls under the umbrella of ‘clothes’ will be reviewed here. 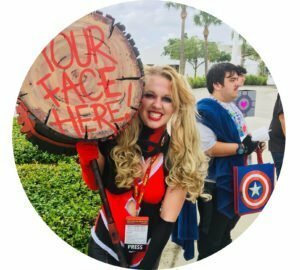 If you sell Harry Potter headbands or Doctor Who leggings, we want to review your product and tell you how we felt wearing your fandom clothing out in the world! Cosplay and Coffee actively works with sponsors to promote their products and content. Companies have the opportunity to have active ads on Cosplay and Coffee as well as a monthly feature in the form of a blog post or YouTube video. Please email tiffani_daniel@yahoo.com for more information.